China’s OBOR reach to the wealthy markets of the European Union has shown concentration on the small Baltic nation of Estonia as a key player in its infrastructure and logistics initiatives for reaching the EU. Estonia, with a population of just 1.2 million, is among the smallest countries in the EU, and currently holds the union’s Presidency. China’s strategy has been to target the country as the nearest full EU member, and to take advantage of and help develop Estonia’s ‘smart’ IT driven interconnectivity and services profile. As the Estonian President, Kersti Kaljulaid mentioned last week in an address to Brussels, Estonia has effectively become the world’s first “digital state’ where nearly all interactions between the government and its citizens are now online, as are communications with Estonia’s 10,000 plus “e-residents” , a service that provides foreign nationals with access to banking, business residency, and other related services. This gives foreign nationals with Estonian e-residency access to the EU but without having to leave their homes. The unique scheme is expected to eventually add a further ten million e-residents to Estonia’s fiscal tax system and boost its services revenue by 2025. This advanced smart society infrastructure also supports e-commerce, including e-customs, which is ideal for China, whose massive e-consumer market – estimated to be approaching a billion people – need such innovations if they wish to buy from or trade with the EU. Estonia is one of the only countries, small as it is, that is able to support such huge numbers – their commerce is nearly all IT driven. For example, cross border transactions, either in packages or finance, require digital time-stamped identification. Google now provides this, as does Estonia, one of the few countries to have thus far adopted such technologies. This speeds up the entire delivery and excise process and adds a digital layer of security, again a perfect match for China and the EU’s needs and one reason that Alibaba has shown such a keen interest in partnering with Estonian companies and its government for their own e-commerce ambitions. E-commerce is only one part of China’s interest in the country. Estonia is the closest EU nation to China, as can be seen from the Trans-Eurasian High Speed Rail Map below. 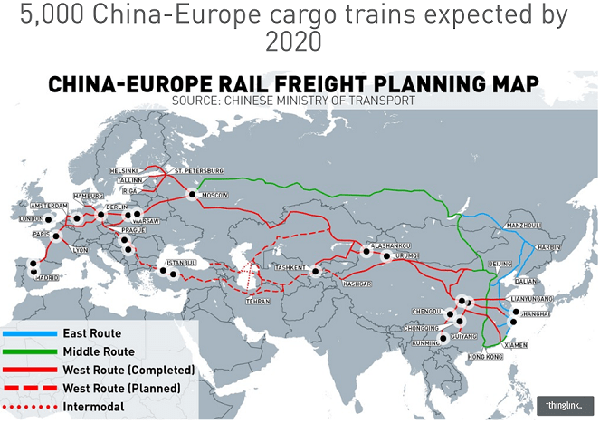 The 5,000 China-Europe hi-speed trains (roughly 14 every day) mentioned above as crossing Eurasia by 2020 is not a fictional account. Although many critics point to the cheaper shipping option as an economic reason for the high speed rail being something of a white elephant, the need remains. High value, perishable consumer goods such as fresh seafood need fast travel times to arrive in optimum live conditions, as do fruits, flowers, vegetables, and dairy products. It should be remembered that these are primary export products for EU members; much of China’s land mass is polluted, and in any event the country, despite its huge size, only possesses 5 percent of the world’s arable land – yet has to support 20 percent of the world’s population. Other EU products and services need high speed transport – including medical supplies, sensitive vaccines, drugs, biological cultures and even animal embryos (China is undergoing a huge animal husbandry upgrade) and human body parts for urgent surgical transplants. High speed delivery is also essential to other industries, and supply chains are changing to fit them. In the fashion industry for example, Marks & Spencer release four collections a year. But brands such as Zara release up to seven. These fashion lines need fast delivery from Asian manufacturing to the stores. In fact, given the fast changing nature, and increasingly fast delivery of products across Eurasia, it would not surprise me to see certain fashion accessories be in fashion and just available for one month only. “Darling, your handbag is just so last month” may yet become a fashionistas put down from 2020 onwards. Other industries with a seasonal trend (such as wine production) may also take advantage in new versions of the “Beaujolais Nouveau” craze. Estonia as can be seen is the closest point of access to China in terms of rail connectivity. However, its not just China that OBOR connects. The South-East Rail section, when completed, will add countries such as Vietnam, Thailand, and Myanmar to that list, although there are serious infrastructure problems in linking these markets to China’s high speed network. As I described in my recent book on China’s New Economic Silk Road, many of these routes are not electrified and there are logistical bottlenecks as well. It is wishful thinking to have Burmese silk delivered by train from Myanmar just yet. India, as a major producer of cotton, will also have to up its game if it wants to take advantage of market access. It recently agreed to connect rail with Russia via the North-South Transport Corridor, a project that will allow Indian goods to gain access to the EU via connecting to the same Trans-Eurasian network as pictured above. As India has just ratified the international TIR customs convention, the Estonian government and its e-businesses should also be discussing with Indian e-commerce companies, the potential for handling their EU trade. Indian based e-commerce companies such as Flipkart, Fashionandyou, Snapdeal, and Myntra are all well placed in the Indian market and looking to expand their reach. 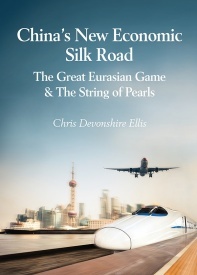 Although Estonia undoubtedly faces competition and will need to work hard to ensure it can keep its share of Chinese e-commerce – greedy European partners will also be looking hard at Estonia’s success – the fact that a small, mobile, and admirably visionary nation can position itself as China and Asia’s gateway to the EU is quite a feat. Estonia needs to continue to develop along this path, increase its coordination with China and the other Asian nations set to be buyers from, and suppliers to Europe. If it can do so, Estonia’s role as a key part of the fast moving, fast tracked e-commerce based link to Asia can keep the nation at the forefront of the EU for decades to come.